When Hamilton Beach asked me to come up with a new slow cooker recipe I jumped at the chance. Then, things got a little tricky when I started trying to come up with something healthy, seasonal and unprocessed (since I’m participating in October unprocessed this year). 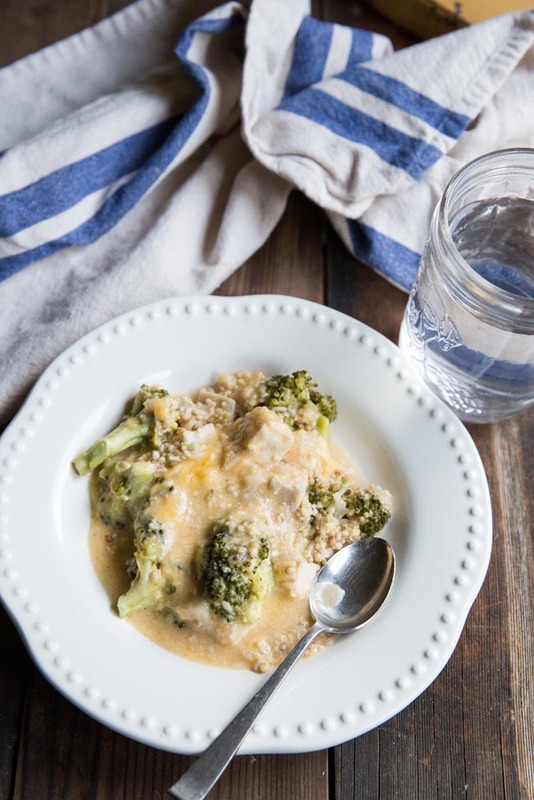 After a few tries I created this recipe for Slow Cooker Cheesy Chicken and Broccoli using 3 whole grains. Why am I so excited about slow cooking?? Because being a mama of a toddler means a lot less time for cooking. 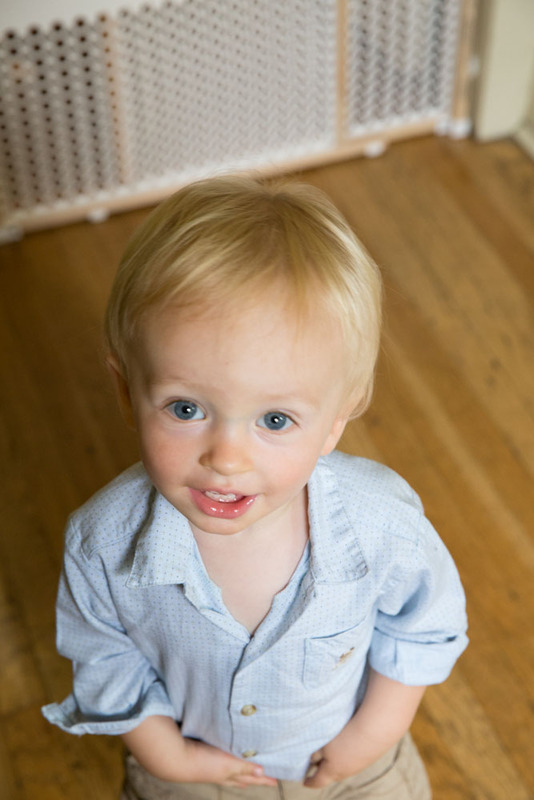 I mean look at these beautiful blue eyes and tell me you would want to spend hours in the kitchen while he wants to be held, played with and read to. Along with this recipe today I’m giving away a Hamilton Beach Slow Cooker. See more info below. So, there you have it. I’m becoming a slow cooker mama. It’s easy and so rewarding to have a meal waiting for you at the end of the day. The only problem I’ve found with the slew of slow cooker recipes out there is that they are meat heavy, with few vegetables and generally un-healthy. So I started out by asking my friends on Facebook what some of their favorite slow cooker meals were. I needed some inspiration and preferably inspiration of the green, whole grain, veggie loving kind. I got lots of ideas so now I just need to put my slow cooker to work this fall! For this recipe I’m using three different grains. Of course you can use all rice if that’s easiest for you (no judgement here!) but it’s fun to try new grains and each grain has it’s own specific health benefit! I’ve tried a few different combos for this recipe and millet, rice and sorghum have been my favorites. Quinoa ended up being mushy so I would avoid that one. Farro would be another good choice if you have farro around (I make so much with farro that I decided to go with a few other grains for this one). 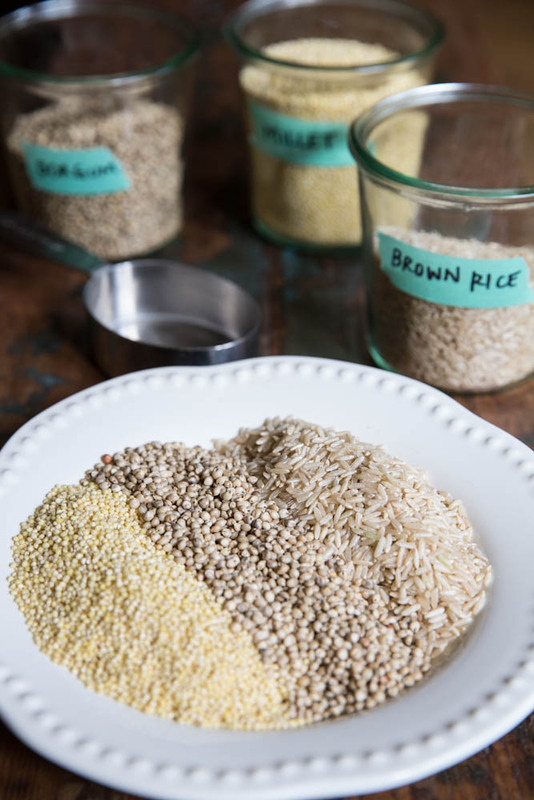 Millet is fun because it makes the grain combo a little creamy while providing heart protective qualities from the magnesium and I hear it also repairs body tissues with phosphorus (great for my husband who just ran a marathon!). Whole grains like millet and sorghum also help reduce risk of type 2 diabetes and provide more fiber and iron than rice. Today I’m giving away a slow cooker just like mine pictured above. One of the great things about this particular slow cooker is that it’s pretty enough to leave out on the counter, which I’ll be doing through the winter! But more importantly, this Hamilton Beach Slow Cooker has a probe thermometer, and is programmable. If you are preparing for a long day at work the machine will automatically set to warm after the cooking time is complete. If I could give you any tips on slow cooking today it would be low and slow. When I’ve tried to cook things on high for shorter time I’ve always been disappointed, especially with high powered slow cookers. You want the meat to be perfectly tender and the veggies still slightly crisp so… low and slow! But if you are short on time, this slow cooker can cook something pretty quick as it seals all of the heat in with a tight fitting lid. I cooked Cafe Johnsonia’s slow cooker black beans in 3 hours, no soaking time and they may just be the best black beans I’ve ever had! Look at all of these greens and grains! And in a slow cooker none the less!! If you have more ideas for healthy slow cooker meals please leave them below in the comments. I am a mom in need of easy meals and appreciate any thoughts, ideas and inspiration! Those who contribute will be entered to win a Hamilton Beach slow cooker! Winner will be announced this Friday is Jenny from Rate the Plate! Hamilton Beach is partnering with several bloggers this month to come up with new slow cooker recipes. Follow the hashtag #slowcookermeals for more ideas! 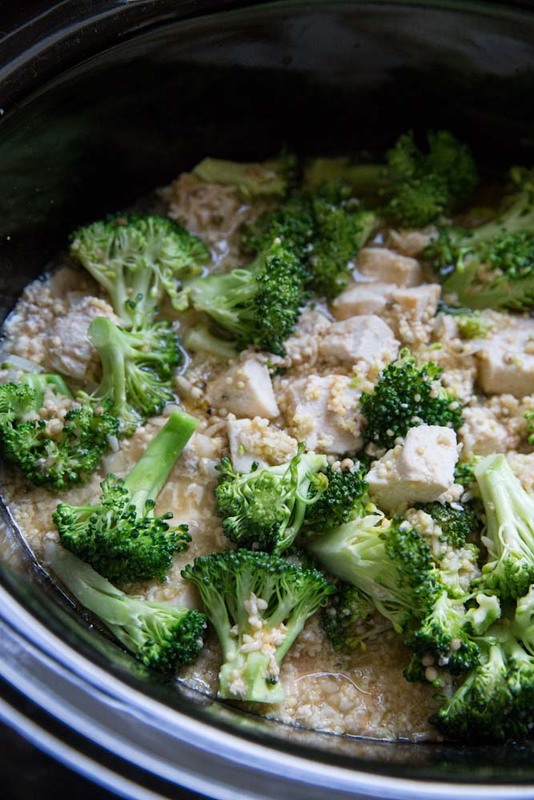 Cheesy chicken and broccoli with 3 whole grains cooked in the slow cooker. Add the chicken breast pieces, salt, pepper, and grains. Pour in the broth and stir. Put lid on the slow cooker and turn it on low. Cook for four hours on low. After three hours, check to make sure there is still enough liquid inside. If not, add some more broth. A half an hour before it is done, add the chopped broccoli and stir. Add more broth if needed. Cook for another half an hour until broccoli is bright green and tender. While broccoli is cooking, melt the butter in a small saucepan over medium heat. Add flour and stir for 30 seconds. Then, add in milk and whisk, making sure there are no clumps of flour. Bring to a simmer then add in 1 cup of the cheese. Stir until cheese is melted and sauce is warmed. Pour sauce into slow cooker, top with remaining 1/4 cup of cheese and let cook for another 10-15 minutes. **For any slow cooker recipe you must get to know your slow cooker. 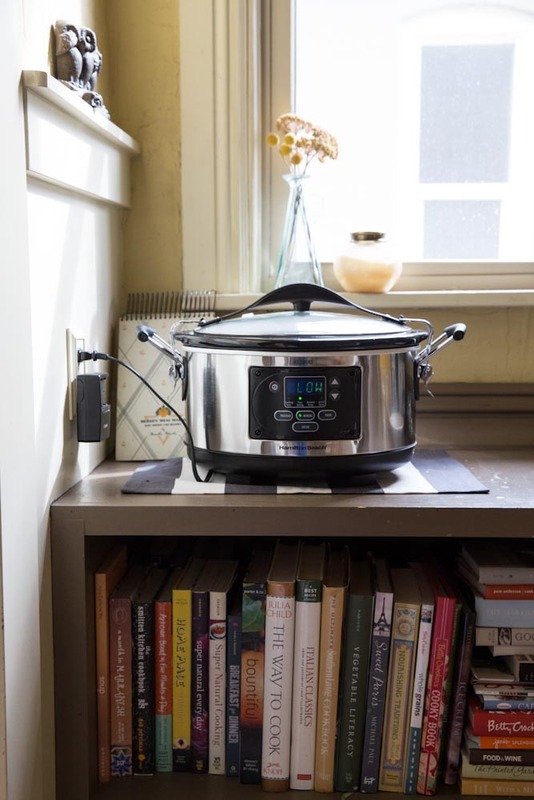 This slow cooker cooks quickly and I often use the low setting for recipes which call for high. If your slow cooker cooks on high most often than you may need to turn the heat up on this recipe. *You can use any combination of grains or just one grain. My favorite combo is rice, millet and sorghum. I found that quinoa breaks down to mush in the slow cooker. Farro would be another good option since it's really sturdy. Also, for this recipe to be unprocessed find a good quality cheese that doesn't have any added preservatives, dies etc. Also, check the ingredient list if you're buying broth - you should be able to recognize every ingredient on the list. Oh boy, I feel like I use my slow cooker at least once a week year-round! SOme things I make in in: shredded chicken (for caseroles, soups, etc. ), dry beans, apple butter, pot roast, and pulled pork! Can’t wait to try your recipe! Mary, I need to try apple butter in the slow cooker, great idea! Broccoli and Cheese Soup is one of my favorites of all time, but you’ve just amped up the healthy factor with the grains. Great idea! And thanks for the warning about quinoa 🙂 Cute sous chef too! Thanks Heidi! I too am a broccoli and cheese soup fan! Need more of that this winter! I’ve got nothing in the realm of slow cooker recipes. I usually work 10 hours a day outside the home and so I’m not there to do the midpoint prep that a lot of these recipes require, and I’m not there to turn it off after 6 or 7 hours. I’d be really interested to see if anyone has any tasty and healthy recipes that you just throw everything in at 6am and can leave it on low until about 5 or 6pm at night and not have to do anything with it unti lthen. Nachista, I think you would like this slow cooker then because it automatically turns to warm when the cooking time is done. So, if you’re at the office all day it will turn off for you and just be warm when you return! Pretty awesome, right?! I love slow cooking! I’m so glad you liked the beans. I make then once a week! 🙂 So, I am thinking I need a programmable slow cooker like that. Such a great feature. I’m looking forward to seeing your other slow cooker recipes. And I’m definitely going to make this one – we love chicken and broccoli! You are 100% right about most slow cooker recipes being so meat-centered. I can’t wait to try yours. I love using a variety of grains. Thanks for both of these ideas Becky. I’ll be trying them both asap! I love making pulled pork in the crock pot and then using th pork for tacos, sandwiches, even funky salads! Love that you used multiple grains! I’m definitely going to be giving this recipe a try soon. Glad you’re loving your new slow cooker! New Mexico green posole is a favorite slow-cooker meal at our house. Throw in a few chicken breasts or pork shoulder, a couple cans of green chillies, chicken or veg stock, a small can of (rinsed) hominy, a mess of garlic cloves, diced sweet onion, a pinch of oregano and there you go! Serve with extra green chilli hot sauce. Heather, I LOVE posole, so thank you for the idea! Will be making that soon! I’ve made ribs and tomato soup,among many other things in the crock pot. Also pulled pork, as mentioned above. I love making soups in it, though, because you can make a large batch and freeze a lot of them. I love to do chicken, corn, black beans and a jar of my favorite salsa! Danelle, I’m looking forward to your stew recipe and will definitely try it once its out!! The best thing I have done in my slow cooker lately has been pinto beans with a ham shank. It was heavenly. I told people I hadn’t had something so delicious in decades! Honestly, I couldn’t stop thinking about those beans. I ate them at least twice a day for days. And come on? Pinto beans? Usually kind of boring, right? I wasn’t alone, the kids and my husband were crazy about them, too. Otherwise, I use my trusty old slow cooker for lots of things – chicken tacos are a big hit. Pulled pork is always spot-on. Roasts and stews never fail. Tammi, thanks so much for the idea! What else do you add wtih the ham shank? broth, seasoning? I’m totally doing this! I love the idea of any kind of winter squash cooked in a slow cooker. I really want to try it – either to puree as a soup or leave in pieces to top a bowl of grains/beans. 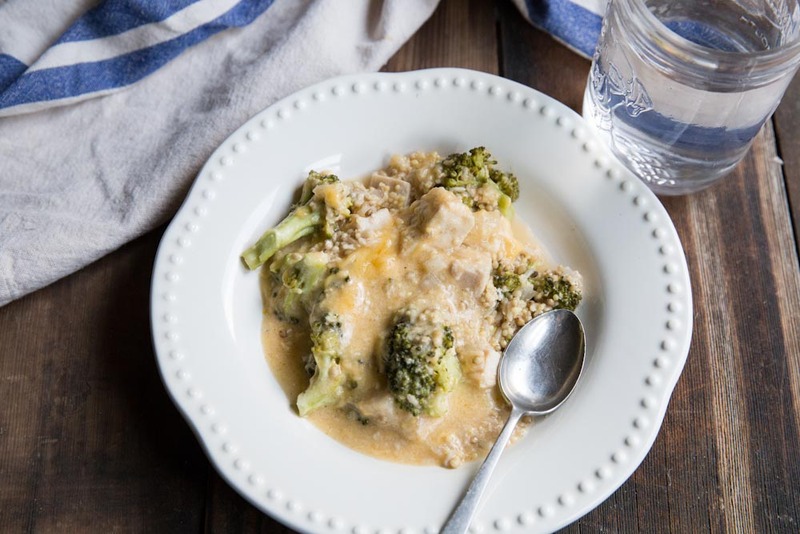 I love breaking out my slow cooker and my family loves cheesy chicken and broccoli so we’ll definitely try this! I love slow cooker oatmeal – and it inspired me to make slow cooker savory farro meals with meat added later on for the week to snack on. I need to start cooking my farro in the slow cooker too. Thanks for the idea Cori! Oh my goodness look at your little sweetie there!! What a fabulous photo that totally reminds me of my own boy some 16 years ago. I have to admit I’m not much of a slow cooker user… but you have me inspired. I love the October unprocessed and I love the grains! Thanks Kim!! I’m just enjoying every minute of toddler hood 🙂 And the slow cooker is coming to my rescue! YES, I need that stir fry recipe asap 🙂 Miss y’all! Thanks Wendy, I’ll be trying this one too! I have only started using a slow cooker in the last few months and feel overwhelmed but have found some great recipes! My favorite so far is Sweet and Sour Meatballs. I’ve heard that meatballs are one of the best recipes for slow cookers so you’re off to a good start! One of my husbands favorites is a beef roast with Sriracha, lime juice, onions and garlic. Low and slow is definitely the way to go- it makes it so tender!! Isn’t everything better with sriracha?!! I have a WW recipe that I rely on a lot in the winter that uses cubed lean pork tenderloin, cubed sweet potatoes, cubed butternut squash, sliced carrots, a bottle of beer and some seasonings. Served over rice, it’s ummm, ummm, good. Linda, that sounds solo delicious! Thanks for the idea! Linda, that sounds just divine. I’d love to have the recipe if you don’t mind sharing it?! I’ll have to try this recipe out sometime this fall. Looks delicious! Tri-tip, now that sounds crazy good! Spend the time with your son now, the time goes so fast and he will remember the time you spent with him instead of doing household chores. Slow cooker and soup recipes are a great way to have healthy meals while having time with your family. Thanks for the encouragement Sabine! I love to do a pork shoulder & then I shred for sandwiches or tacos. i don’t use a slow cooker much but every fall and winter think i have to push myself to use it more. chili’s are just so good when made in them and take very little effort – so much better than what can get in the store. I gave my slow cooker away to a church organization last Spring and now I am totally regretting. Would love to win this free give away. Mine has been collecting dust up until recently so I totally understand! Thanks for stopping by my blog! I use my crockpot for Sunday pot roast. This gives me leftovers/planned overs that I can use during the work week. I think pot roast is a recipe I need to master. I really haven’t made it much and it feels like a essential classic. Thanks for the idea! Oh I love slow cooking, but desperately need a new crockpot. We love doing big batches of pumpkin oatmeal. Chicken and dumplings, soups, and whole grain casseroles with barley, broccoli, cauliflower, and more! I love to make spicy green chile chicken for tacos or enchiladas in my slow cooker. Overnight oatmeal is also a favorite! 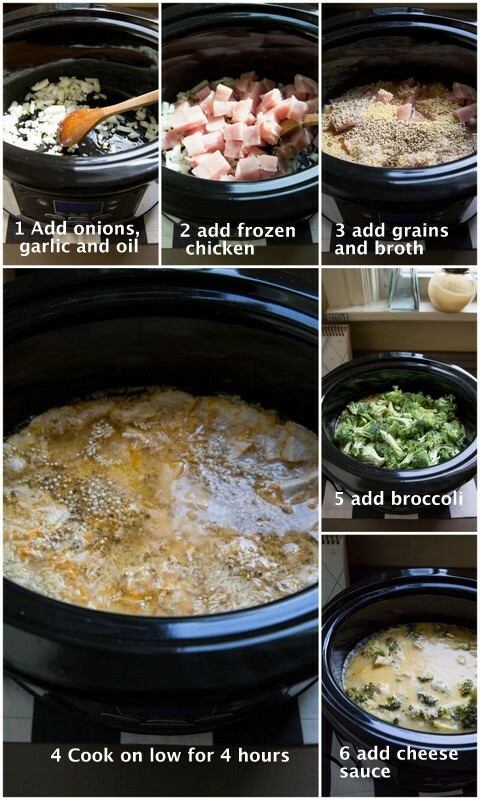 I like to make a big slow cooker full of chicken on the weekends so I can use it all week long for quick meals. For BBQ chicken, I make BBQ chicken quinoa bowls, quesadillas, and salads all week long. I’ve done this a few times too Allison and every time I do, I say, why don’t I do this more often. It makes weeknight meals so much easier. Thanks for the reminder! Love this Annie. I’m definitely trying it soon! My favorite thing to make in a slow cooker is pulled pork. There’s just no better way to enjoy pulled pork!! I totally agree Emily! Oh man, I love slow cooker meals – and mine just broke down! Best crockpot recipe I have done recently is Taco Soup. Basically dump chicken breasts, crushed tomatoes, diced onion and peppers (and whatever other veggies you want, I add in mushroom and spinach) plus some chicken stock and spices (chili, salt, pepper, garlic) and voila! After it has cooked for 6-8 hours, take out the chicken and shred it, put back in soup. Serve with cilantro, avocado and tortilla chips and enjoy! I love a pot of beans cooked with Prosciutto and fresh vegetables. Amy, I’m totally putting proscuitto in with my beans next time! Great idea. And do you put the veggies in at the the end? Oh man a programmable crock pot would be amazing!! I roughly chop apples and leave them in mine to make apple sauce. If I feel lazy I leave skins on and run the results through one of those sieves to removes seeds/skins. I also like to make overnight coconut milk oatmeal- so creamy! What a great recipe and giveaway! I love making Thai Chicken Curry Soup in my crock pot for something healthy and different. It’s made with coconut milk, lime, and cilantro so it is fresh but still warming and delicious. I also make something called congee, a rice porridge. It is easy and makes a great nourishing breakfast. I use my crock pot 1-3 times per week! I love my slow cooker, but I need to use it more! One of my favorite things is to make a taco/burrito filling in it with flank steak, green chile, onion, etc. And the #1 thing I’ve learned is that with large cuts of meat (roasts, pork loin, etc. ), it’s totally worth the time to sear it before you put it in the slow cooker! My crockpot is probably about as old as I am. I inherited it & it will probably run forever, but it’s only 4 qts. I’d love a fancy new one that’s bigger! Jenny, you are the winner of the slow cooker!! Please email me your address to beckyros at gmail. Congratulations!! I so love cooking meals in the slow cooker – smelling the promise of a delicious meal all day without spending all day in the kitchen making it! Often I make soups/stews/chilies in my slow cooker, spoon food. 😉 I like that this cheesy broccoli dish is meal we could eat with a fork. I’m going to try this with freekeh! Great idea Catherine! I’ll have to try that too! Do you have any healthy slow cooker recipes that I can prep before work and then leave cooking on low or warm for 8-9 hours while I’m at work and don’t have time to run home and make adjustments? The reason why I almost never use my slow cooker is that I can’t leave work after 3 or 4 hours to run home and add things to the recipe. And I don’t really get a long enough lunch break to be able to make it home, do additional prep and make it back to work in time.